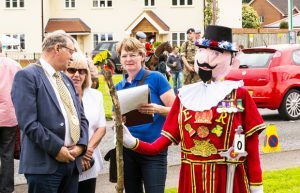 ROYALTY graced the pastures of Pirbright on Saturday as swarms of visitors flocked to the village green to enjoy the annual Scarecrow Festival. To mark The Queen’s 90th birthday, the Royal Family – in scarecrow form – were out in force, with a focal point of Her Majesty Trooping the Colours on a horse made of willow. Organised by Helen Whitworth and a team of volunteers, visitors could also join the Royal Family for a birthday High Tea in the church, as did special guests the Mayor and Mayoress of Guildford, Gordon and Sue Jackson. The talent and ingenuity of Pirbright’s scarecrow makers could be seen in abundance as they tackled the challenge to create something that starts with the letters of the name ‘Queen Elizabeth’ for this year’s theme. Other familiar famous faces included The Blues Brothers, The Incredible Hulk, James Bond and even Albert Einstein, all safely guarded by Colin the Beefeater. The winning cup went to Pirbright Village Primary School for their imaginative ‘Z’ is for Zoo creation, while dinosaur fanatic Milo Hyde won Best Novice for his innovative Quetzalcoatlus, Queen of the Cretaceous Skies. Meanwhile, youngsters joined in games and races, chairplane rides, pony rides, face painting and a rabbit hunt. They could have a smashing experience breaking old crockery or a splashing time at the wet sponge stocks. There were plenty of stalls and refreshments, a dog show, and prizes for Fancy Dress, in which Bella Handyside and her pretty pooch Benji came first – Bella designed and made the costumes herself. Picture Special in the next News & Mail.